NPTGS Multicultural Director Lily Chow’s long-awaited third book on Chinese immigration to B.C. is out and available on Amazon. 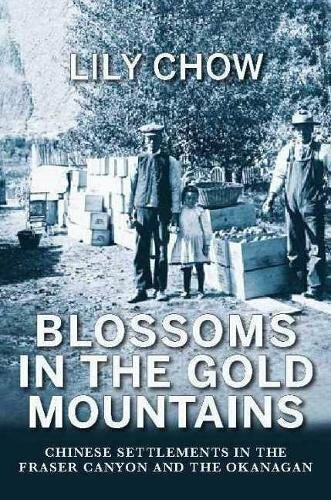 Blossoms in the Gold Mountains: Chinese Settlements in the Fraser Canyon and the Okanagan, Caitlin Press will also be on sale at the New Pathways to Gold Society’s 10+ anniversary celebrations in the traditional territory of the Lytton First Nation on April 14. Why not come up and get an autographed copy? Check out our event page. “Partners on the Pathway” Trade Show/Exhibition and networking session, Kumsheen Secondary School, 11:00 a.m. to 4:00 p.m.
Chief Cexpe’nthlEm Recognition and Reconciliation Storytelling Circle, celebrating the courage and wisdom of Chief Cexpe’nthlEm in bringing peace to B.C. in 1858, Parish Hall, commencing at 4:30 p.m.
A traditional feast at the LFN Memorial Hall, catered by the LFN. Following th feast, there will be a concert performed by Aboriginal musicians. Proceeds go to projects to assist corridor communities impacted by 2017’s wildfire crisis.